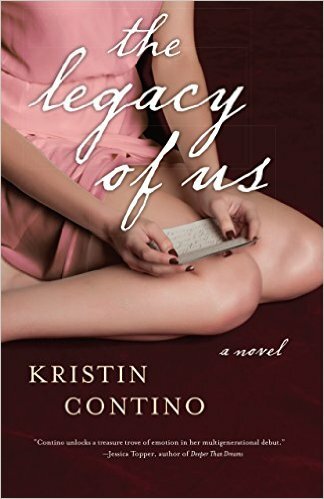 #SPOTLIGHT ~ “The Legacy of Us” by Kristin Contino is ON SALE NOW!! Taking readers from 1905 Italy to present-day Philadelphia, The Legacy of Us uncovers how the lives of three generations of women are changed by love, loss and one little necklace. Liz Moretti thought she knew almost everything about her grandmother, Ella, from her love of “The Golden Girls” to the perfect pound cake recipe. But when Ella passes away and Liz finds a cameo locket with a marriage proposal engraved inside (from a man who was not her grandfather), she realizes that sometimes a person’s secrets are discovered only after they’re gone. On top of losing Ella, Liz’s career as a jewelry designer is stagnant and her love life lacks sparkle, too. When she reconnects with the one who got away, Liz thinks maybe things are finally starting to look up. But after a few drinks and a trip down a flight of stairs, Liz wakes up to realize the cameo is gone. Her ex offers to look for it, but so does Justin, the intriguing new guy in her apartment building. While dealing with her feelings for two very different men and generally trying to reinvent her mess of a life, Liz finds answers and solace in Ella’s diary. The story of the cameo, and the relationship between her grandmother and great-grandmother, an outspoken socialite from Italy, inspires Liz to grow up and accept responsibility for her missteps. Eventually she must choose between the life she thought she wanted and the promise of something better. This looks like a great read, with so much insight to these women’s lives and how this could parallel our lives. With my children, I am constantly thinking about how I handle myself around my children and what we do together. Reason being is that I care about the legacy I leave behind to my children. I am reading this book now, and it is fabulous!! I know you will leave behind a great Legacy, Gary! I can tell by how you write about it!